Vibrant, multicultural and dynamic, the University of Johannesburg (UJ) shares the pace and energy of cosmopolitan Johannesburg, the city whose name it carries. Proudly South African, the university is alive down to its African roots, and well-prepared for its role in actualising the potential that higher education holds for the continent's development. UJ has transformed into a diverse, inclusive, transformational and collegial institution, with a student population of over 50 000, of which more than 3000 are international students from 80 countries. 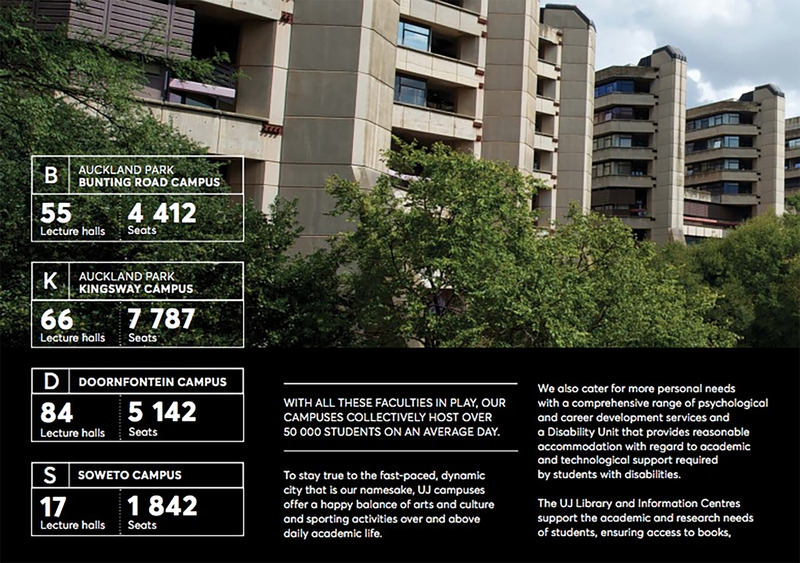 This makes UJ one of the largest contact universities in South Africa (SA) from the 26 public universities that make up the higher education system. The phenomenal success story of the University is one that has surprised critics and won over sceptics. Since its establishment in 2005, and under the bold and visionary leadership of its first Vice Chancellor and Principal, Professor Ihron Rensburg, the University has had a remarkable journey with major accomplishments in transformation, equity, access, and Pan African and global excellence. The vision of the UJ is to be "an international University of choice, anchored in Africa, dynamically shaping the future". The mission can be described as follows: "inspiring its community to transform and serve humanity through innovation and the collaborative pursuit of knowledge". These are underpinned by four values, namely: imagination, conversation, regeneration and ethical foundation. The six strategic objectives provide a focused means for realising the Vision, Mission and Values of the University as set out above. They further represent a re-working of the original UJ Strategic Thrusts 2020 in the context of a wider positioning of the University as "The Pan-African" Centre for Critical Intellectual Inquiry, with the primary goal of achieving global excellence and stature. Excellence in Research and Innovation. An International Profile for Global Excellence and Stature. Enriching Student-Friendly Learning and Living Experience. Fitness for Global Excellence and Stature (GES). Recognised as the country's second strongest brand, UJ offers world-class, internationally recognised academic programmes based on curricula informed by cutting-edge developments in both undergraduate and postgraduate education, and that are designed to prepare students for the world of work and for global citizenship. Our curriculum is increasingly reflective of previously marginalised scholarship that talks to a transformation and decolonisation agenda, with Africa at its core. The university has 7 Faculties viz., Education, Law, Humanities, Fine Arts, Design and Architecture, Health Sciences, Science, and Engineering and the Built Environment. On 1 July 2017, the Faculties of Economic and Financial Sciences and Management merged to form the College of Business and Economics, housing the newly established Johannesburg Business School. The University has four campuses, namely the Auckland Park Bunting Road Campus; the Auckland Park Kingsway Campus; the Doornfontein Campus; and the Soweto Campus. The University of Johannesburg's (UJ) global stature and academic robustness have been given a significant boost through its inclusion in the Top 500 universities in the Academic Ranking of World Universities (ARWU) released by the ShanghaiRanking in 2017. ARWU is the most prestigious global ranking system in the world which uses only externally accessed, objective measures in its assessment of university performance. It is a ranking system that is heavily focused on research quality and impact. UJ is the first and only African university admitted to the highly respected consortium of 28 research-intensive universities in the world,Universitas 21 – a significant endorsement of the growing international stature of UJ. Under South Africa's National Development Plan (NDP), the Vision 2030 Awards honoured UJ in 2017 for the role the University plays in providing sound education to a diverse South African and international population. UJ is now ranked 7th amongst Africa's universities, 5th in South Africa, and ranked within the top 2.3% of universities in the world as published in the QS World University Rankings 2017/2018. UJ is ranked 63rd among all BRICS universities. International recognition for the University of Johannesburg has been given another boost by its inclusion in the top 200 universities listed in the THE Young University Rankings 2017 results. Within THE Millennials, UJ is ranked in the top 18 which is a remarkable achievement and testament to the massive strides it has made in gaining global acknowledgement for its academic excellence and high impact research. Seen more widely as a 'challenger' university, UJ is set to make a significant mark in the global higher education arena in innovative and disruptive ways. A significant transformation of its student demographic profile - From 60% Black students in 2005, UJ now reflects South Africa's demographics, with 86% of its student body from previously disadvantaged backgrounds. Significantly improved course success rates, with graduate output close on 13 000 per annum, with nearly half of all graduates today the first in their families to attend university and graduate. 25% of the national output of Black candidate chartered accountants is produced by UJ, more than any other tertiary institution in the country. Empowered thousands of young people and their families as 95% of all graduates find employment within 12 months. Transformed the lives of the poorest in our communities – through significant investments in student support, including tutor support, financial aid, meal assistance, intercampus bus transport, tablet devices for NSFAS funded first year students, and raising close on R 288 million towards bursaries for "Missing Middle" students, who do not qualify for government sponsored financial aid. Transformed the academic landscape with the number of Black academics rising by more than 300% from 140 in 2005 to 450 in 2016. Increased its research output by 400%, and doubled its share of national research output to almost 8%, with majority of its publications in international journals. UJ today is home to, amongst others, the NRF Centre of Excellence for Integrated Mineral and Energy Resource Analysis (CIMERA), which is crucial to the development of our national economy; and the Institute for Pan-African Thought and Conversation (IPATC) creating a vibrant platform for academics from across Africa to converge and bring to bear intellectual capabilities and contributions that have been marginalised on the global stage.